In 2015, the Steuben County Economic Development Corporation purchased a 70,000-square foot old manufacturing complex with the dreams of one day turning the facility into a co-working space, training center, and an incubator. With the initial investment of almost $500,000, the board and community committed to a project that would be a cornerstone project listed in the original application for the Regional Cities Initiative (RCI) for the State of Indiana. Many projects, including this one, help the Northeast Indiana region secure $42 million dollars of grant funding that could be requested for projects who accomplished certain things. First, the local community had to generate 60% of the total cost of the project. Only 20% could come from local government, and the final 20% could be requested from the Regional Development Authority (RDA) which is the legislative board designated for this region for the RCI project. By November of 2016, The Enterprise Center project was ready to present its case to the RDA Board. Coming to the table with over 64% private sector funding and contribution, 19% from local governments, we were proud and anxious to ask for the remaining 17% of the total funding from the RDA Board. The first phase of this project totaled $1.9 million dollars and our request of $323,000 was awarded to the project in December of 2016. Starting in January of 2017, construction immediately started on the training space within Building A. This included the addition of classrooms and office space to house Indiana’s WorkOne region office. The first classroom holds fifteen (15) computer workstations and audio/visual equipment. The second classroom holds eight (8) computer workstations, four (4) CNC simulators, and audio/visual equipment. These classrooms will allow the community and the region to quickly respond to in-demand training and certifications across multiple industries and trades. Also during this time, installation of four (4) CNC Machines (two mills and two lathes) as well as 10 welding stations (five Lincoln’s and five Miller’s). These two (2) industrial trades historically have been at the top of the list for desired trained workforce in our region. In terms of the welding equipment, we also made sure that we included all three variations of welding; stick, mig and tig. “Learn, Connect, Thrive” is the brand of the Enterprise Center. These core values are consistently at the center of everything that we do. Learn describes the function of the training center and the collaborations that we currently have with many training providers including but not limited to Trine University, Freedom Academy, Ivy Tech, Impact Institute, IPFW, etc. The facility can quickly meet the demands of training needs by various industries to continue to build talent here regionally. Connect describes the resources and assets that we surround the facility with. This includes the offices inside the facility like the Steuben County Economic Development Corporation, Indiana's WorkOne Region Office, Angola Area Chamber of Commerce, and Midsolv (a local IT company). It also includes that resources that these offices have relationships with outside of its walls. Thrive is the outcome desired by what the facility does. As it pertains to incubator space, the Enterprise Center is helping to lower the cost of entry for a new company to the market. We are providing resources and connections to assets that encourage growth in a successful and manageable way. All of this helps benefit Steuben County, it’s communities and the region. 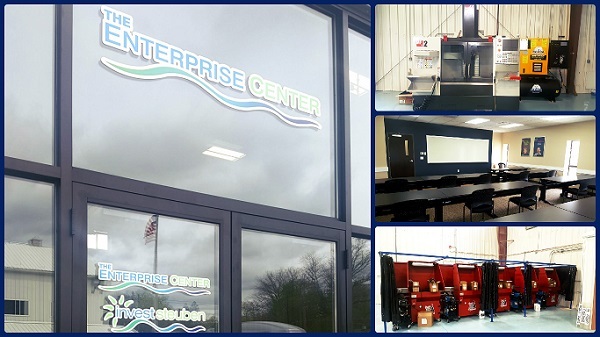 The Enterprise Center opened its doors to start holding classes and perform various other functions in mid-2017. At the annual EDC meeting, the following inforgraphic was presented detailing the programs that have been successfully completed at the Enterprise Center in 2017 and early 2018.